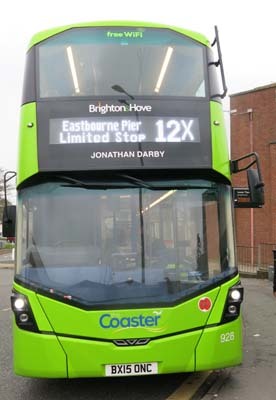 Connections with Brighton and Hove : Jonathan Darby, Rector of East Dean and Friston from 1702 to 1726 was known as the sailors’ friend. This was because of his attempts to warn ships and their crews of the dangerous waters around Beachy Head and to rescue them if they were shipwrecked. Beachy Head was a dangerous place for coastal shipping, not only because of the rocks below the waves, but also from strong winds that could blow vessels onto them. A shipwrecked crew had no escape up the sheer chalk cliffs and many sailors perished. Jonathan Darby became so distressed at having to bury them in his churchyard that he enlarged an old smuggler’s cave part way up the cliffs to provide a refuge from the sea. On stormy nights he would sit in this cave shining a lantern out to sea as a warning. His actions saved many lives but cost his own as he contracted pneumonia through exposure to the wind and rain. He is buried in East Dean churchyard. Eventually, Darby’s example was to lead others to construct permanent lights here, including Belle Tout and Beachy Head lighthouse itself. The Old Parsonage, where he lived, still exists and is opposite the eastbound number 12 bus stop in East Dean. 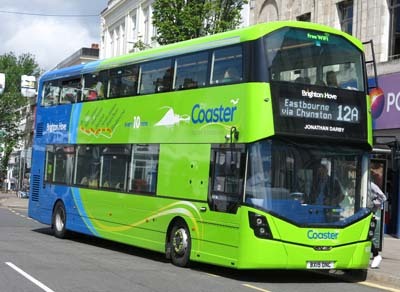 928 Mercedes Streetdeck - carried name since delivery in March 2015 on Coaster Route 12.